Mark Duncan at Yachting Partners sends news of a further price drop, this time of $3 million, on the 45.7m motor yacht O’Khalila, a joint listing with Bertrand Vogele and Matt Albert along with Merle Wood & Associates. Built in aluminium by Palmer Johnson in 2007, this superyacht has two complete deck areas plus a raised pilothouse which blends into an extensive open-air deck. A modern interior by Nuvolari-Lenard accommodates 12 guests in six staterooms and she offers blistering performance, with three 3650hp MTU engines powering her to a cruising speed of 30 knots and a top speed of 34 knots. 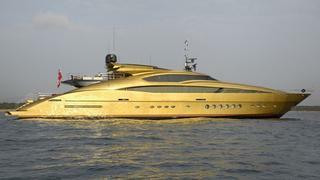 O’Khalila is available for inspection at the Monaco Yacht Show, now asking $19 million.